Article IV Dues and Fees of the new Bylaws - Annual dues of the individual member shall be assessed every 31st day of May of each year shall be remitted on or before the 30th of June of the same year. Each council which has not paid the dues and fees for any calendar year on or before 31st of May of the year immediately preceding calendar year will be considered delinquent Council. The Philippine Librarians Association Inc.- Ilocos Region Librarians Council (PLAI-IRLC), Inc. in cooperation with Ilocos Region Librarians Association (IRLA) will be conducting a 3-day seminar on "Enhancing Capabilities of Librarians on Library Standards and Accreditations" on May 25 – 27, 2011 at Ilocos Norte National High School, Laoag City. For details and inquiries, get in touch with the following: Sonia S. Isip, 09205841991, browneyes007_ ph@yahoo.com; Ligaya N. Caranay, 09162520327; (072) 242-5535/36 loc. 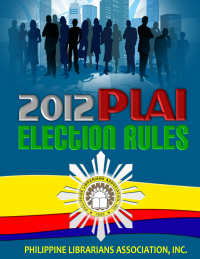 123, slc_library@yahoo.com; and Marilou Andres, 09183589769; mnandres@yahoo.com.